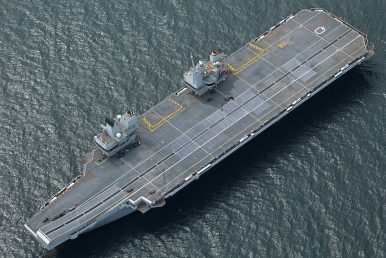 A New British Military Base in Southeast Asia? A closer look at the recent hype and the broader inroads Britain has been trying to make in the region of late. Comments by British Defense Secretary Gavin Williamson about new potential British bases in Southeast Asia last month have unsurprisingly grabbed international headlines. While the hype itself is far from surprising, it has nonetheless spotlighted some of the broader inroads Britain has been trying to make in the region in the defense realm in recent years amid the confluence of wider domestic and regional trends. The idea of British military presence in Southeast Asia as well as a globally is of course far from new. Even as its position as a colonial power there declined, Britain continued to maintain a significant military presence in Southeast Asia until its announced withdrawal ‘East of Suez’ in 1968 under then Prime Minister Harold Wilson. And while Britain’s role in the region today is often viewed non-militarily in terms of wider popular perceptions, it in fact still continues to maintain an important defense presence in some of these countries, whether to support bilateral activities such as training and capacity-building or wider multilateral engagements such as activities tied to the Five Power Defense Arrangements (FPDA), an enduring collective security agreement that also includes Malaysia, Singapore, Australia, and New Zealand. That said, over the past few years, British policymakers have sought to reemphasize the country’s role in the Asia-Pacific in general and Southeast Asia more directly and specifically, including in the defense realm. This is due to a confluence of internal and external trends, including Asia’s own growing prominence as a region of interest, rising concerns about aspects of Chinese regional behavior, as well as Britain’s own Brexit predicament, which has raised questions about the future shape of its global role and reinforced the need for policymakers to define the value proposition of engaging with Britain on its own as opposed to just a part of Europe. As a result, we have seen a growing focus on aspects of British military presence in Asia. While attention is often on more headline-grabbing developments such as British warships in the South China Sea, this has been more multifaceted when one also considers inroads that receive far less focus, with recent examples including a new defense dialogue that it inaugurated with Vietnam late last year and an increased focus on cybersecurity and counterterrorism with several Southeast Asian states. Over the past week, Britain’s defense presence in Southeast Asia has been in the spotlight again with talk about new basing arrangements in Southeast Asia. The headlines emerged following comments that UK Defense Secretary Gavin Williamson offered to the British media outlet The Telegraph, where he mentioned that Britain would seek new bases in Southeast Asia and the Caribbean. The idea of a greater British military presence of some sort in Southeast Asia in general and some of the countries mentioned in particular would not be as dramatic as it is being portrayed. Indeed, Britain has already been attempting to increase its defense presence in some of these countries across several realms that attract far fewer headlines than the notion of “bases” but are nonetheless quite significant. Take fore instance the two countries that were cited as potential locations in media accounts – Singapore and Brunei. Singapore has been publicly mentioned as being among the locations for Britain to increase its regional defense staffing, while Brunei, where Britain maintains a military presence till this day, has been among the countries where we have seen growing attention to certain aspects of defense ties such as military exercises. That said, how exactly this plays out beyond the headlines is less clear. Smaller Southeast Asian states can be sensitive about how they handle the subject of major powers increasing their military presence in the region, so it would not be surprising if progress occurs in a way that is less in the spotlight. It also remains to be seen exactly what the shape of increased British military presence in the region would actually amount to more tangibly, given that the term “basing” is often used as a catchall term for various forms of military presence that ends up telling us very little about what that presence is more substantively. Nonetheless, given the inroads Britain has already been trying to make in Southeast Asia and the Asia-Pacific more broadly on the defense side over the past few years, this will be an interesting space to watch in 2019 and beyond. A recent interaction highlighted the wider security relationship both sides have been attempting to boost recently. Mark Field on Strengthening UK-ASEAN Relations Post-BrexitSingapore-UK Defense Relations in Focus With New PactUK-Vietnam Military Ties in Focus with Defense MeetingWarship Visit Spotlights UK-Brunei Military TiesWhat’s Next for Vietnam-UK Relations in 2019?